I had to cut our ski trip short to Holiday Valley on Tuesday when I crashed while stopping at the bottom of the run and broke my left collar bone. I turned my board sideways to stop and stood up and assumed that since the run was over so was the danger. Oops. I caught the wrong edge and flipped over. I gave Andy and Chris a thumbs’ up with my right hand but as I stood up my left shoulder didn’t feel right. I think my response to Andy was “It feels like it’s in two parts”. The snow-patrol met us in the chalet and splint’ed me up and treated me very well. I wasn’t the first brake of the day. I asked. Two people at the Hospital commented on my splint. Andy, Goldwin & Chris were nice enough to cut their trip short and take me back to the St. Catharines General for about 4:00. I really appreciated that. While I was waiting I helped a blind man find the reception desk – As I said “Can I lend you my arm” I thought how it was literally the lame leading the blind. Lindz took the bus down to rescue me and the car and got there with some car magazines for me around 7:00PM. At about 9:00 they saw me and at 9:30ish they sent me away with a clavicle brace and some tylenol 3. I’m not in any constant pain, but let’s just hope sleep goes well. 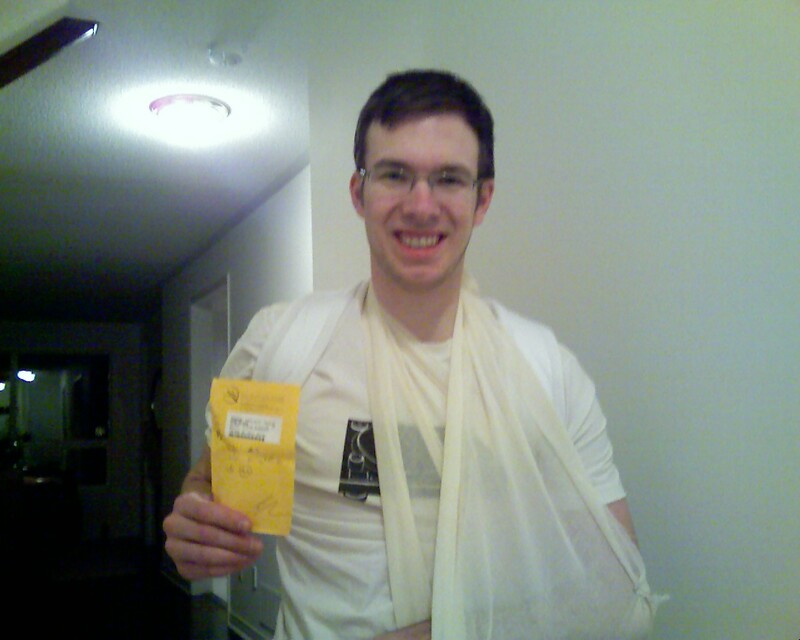 This was my first return to the ER since I broke my right collar bone in grade 10. The lesson here: always be safe and Lindsay’s married into some weak collar bones. The Wiki: A few year ago I created the WebCT Wiki to help document WebCT at Brock and some its idiosyncrasies. It proved to be a great resource to build an FAQ in and write up a few instructions for how to do a few things. 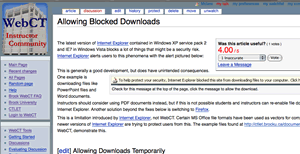 The wiki format ensured it could be updated from anywhere by anyone. Though it was mainly me and my colleague who contributed to it the ability to post something to address an issue immediately and later refine it was very helpful. I’ve taken the approach that if I think I’ll have to explain something again it’s worth adding to the Wiki where I can either direct others to or simply copy and paste an answer from (the latter being my preference). Google recently added their old Jot Spot acquisition to their Google Sites. Jing: Jing is the best option for quickly recording a “screen cast” or taking screen shots. It’s a stripped-down tool that fills a niche below Tech Smith’s other product Camtasia. Screen casts (videos) of how to do something can quickly be recorded of the whole screen or just a section of it and posted to the web as a flash screen. Screen captures (images) can quickly be taken and annotated with text, arrows and shapes. If you haven’t seen it already, this is one of the best commercials on TV right now. For the record, I’ve been to only one or two McDonalds this decade, and I haven’t been trying to avoid them. Looks like they need some good ads. Rogers Canada recently rationalized their data rates. Many see this as an indication that the iPhone may soon reach Canada. You are currently browsing the iMatt :: The Blog of Matt Clare weblog archives for February, 2008 .